Kim's Ballet training began at age nine in Jackson, MS with Thalia Mara. At age 13, her parents moved to Kansas City, MO where Todd Bolender had just revived the Kansas City Ballet. She studied the Balanchine Technique under the tutelage of New York City Ballet dancers Todd Bolendar, Diana Adams, Una Kai and Jacques d'Amboise and attended the School of the American Ballet Summer Intensives on Full Scholarship with the finest Balanchine Instructors including Suki Schoer, Alexandra Danilova, Richard Rapp, Stanley Williams and many more inspiring teachers. As a professional ballerina with KC Ballet, and the first graduate of the KCB school, Kim performed many soloist and principal roles in ballets by Todd Bolender, George Balanchine, Alvin Ailey, and Margot Sappington, incorporating ballet, jazz, modern, and tango. Kim retired from professional dancing and opened the Midtown School of Dance in 1998 so she could continue to share her love of dance with children. The Midtown School of Dance merged with the Community School of the Arts at Kansas City Young Audiences in September of 2007. 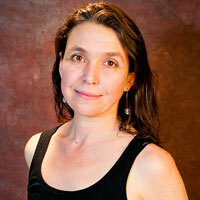 Kim now serves as Dance Department Head and was awarded the Lighton Prize for Teaching Artist Excellence in 2013. With my roots firmly established in Balanchine classical ballet, I strive to incorporate quality technique in an all-inclusive and positive environment. My dance classes engage your child's brain and body connections and create an atmosphere for learning life skills through movement education. Activity is an essential step in the social, mental, and physical development of your child. In my dance classes, children learn valuable techniques while enhancing their rhythm, poise, coordination, confidence, and general fitness level in a fun and social setting. My classes serve as an avenue for creative expression and allow participants of all ages and skill levels the opportunity to improve on fundamentals in an exciting, energetic, and welcoming environment.